How to test Soil pH? Soil pH can easily be tested by using Manutec Soil pH Test Kit. Developed on CSIRO research, It is accurate, easy, economical and instant. First a small sample of dry soil is collected from the area to be tested, if soil is very wet, it can be air dried on sheet of paper. If sol is hard and lumpy, crush to finer so that it is easy for mixing and testing. If you are testing soils around shallow rooted plants such as small plants, shrubs or lawns etc. take sample at a depth of about 10-15 cm below surface. If you are testing around deep rooted plants such as Fruit trees or large shrubs, take sample at a depth of about 1 ft (25-30 cm) below surface. Try to remove any un-decomposed organic matter like leaves/bark etc. This kit can be used to test Potting mixes or compost, however while taking sample, try to remove any un-decomposed large chunks such as bark. We recommend to take a sample about a half a tea spoon to a teaspoon, any larger quantity, too much dye and Barium powder will be wasted to mix and test. 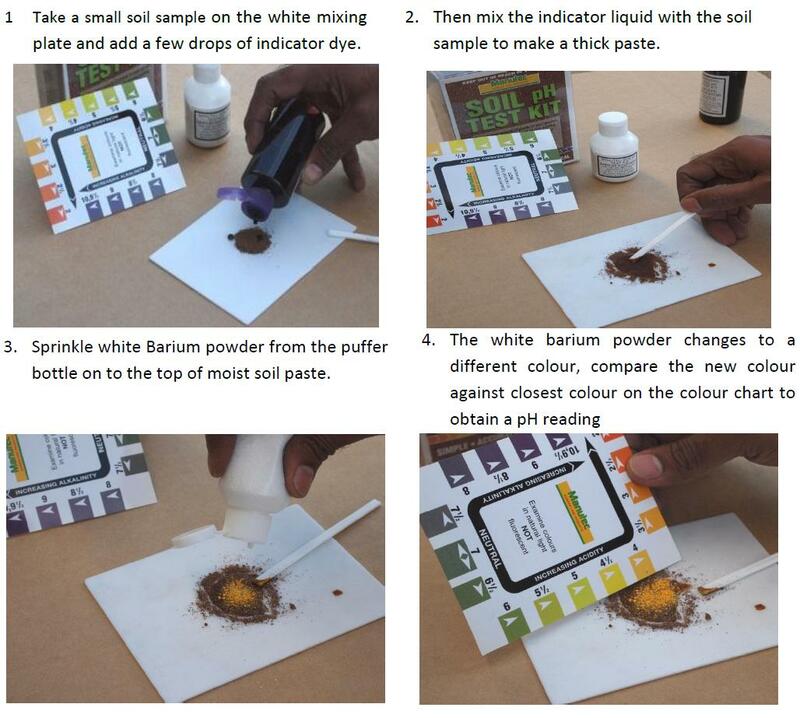 A few simple steps illustrated below guide you to test your soil sample. Please note these steps are just an illustration only, the actual color you may get varies depending on pH of your soil or material being tested. For more details read information on product packaging. Note: The Manutec Soil pH Test Kit is non toxic and very safe to use. Normal precautions should be taken to store the kit in a dry place away from Children and Pets. For long lasting shelf-life, after use keep bottles closed properly and away from exposure to direct sunlight. Please also note that, the indicator dye may stain your hands, hence it is advisable to use gloves as required while testing. However stain can be easily removed by washing with normal soap/cleanser. Once you know pH value of your soils/potting mix, depending on acidity or alkalinity, you need to adjust the pH to neutral using soil conditioners. Please visit how to adjust soil pH page menu for more details. How often pH has to be tested? Soil pH tend to vary from time to time depending on influence from local geographical conditions (such as region being acidic or alkaline origin), high rain fall area, sandy soils, type of fertilisers used etc. Hence it is always preferable to test pH once a season, particularly beginning of peak growth periods of Spring & autumn when gardens are cleaned and soils are prepared. 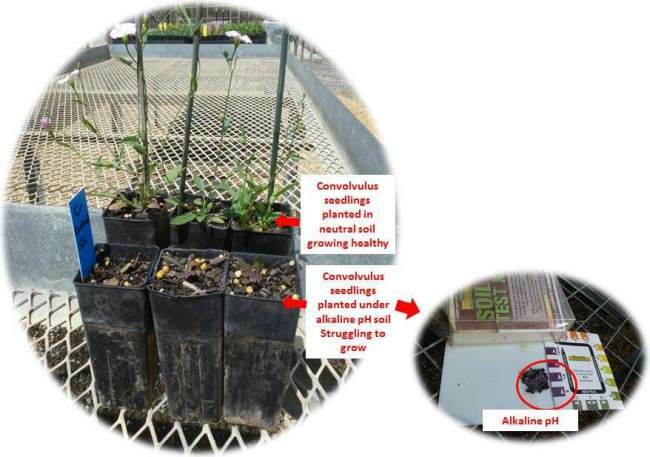 It is also advisable to test pH of new soils or compost prior to use planting new seedlings/plants to ensure the growing medium has neutral pH to facilitate new and young growth. Below is an illustration of testing soil prior to planting Lime plant. ——————————————————————————————————————————————————————————————————————– Case study: Some times new soil or compost we buy or use, can be alkaline!! 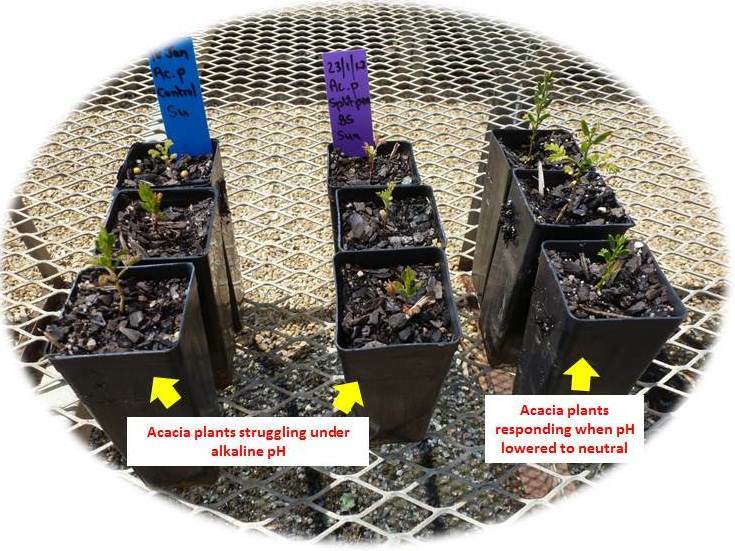 Picture on the right side is an example of a new compost soil being tested alkaline. Young seedlings when planted under high pH condition, struggle to establish as roots are affected. 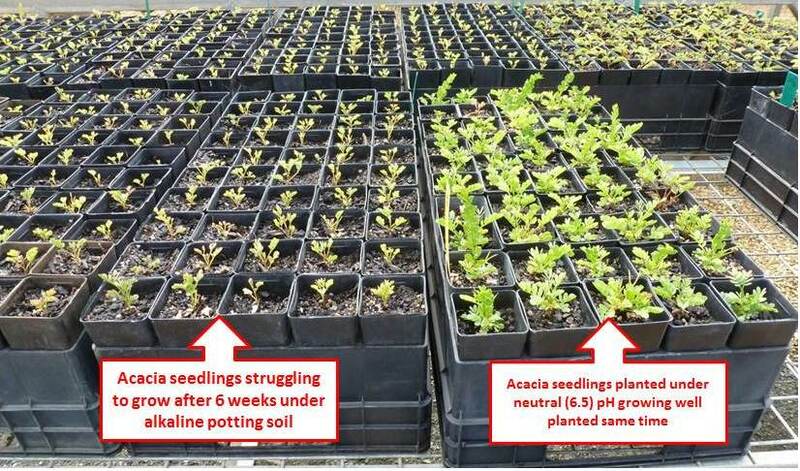 Below are a few photos from a commercial nursery where seedlings are struggling to establish when planted under alkaline (high pH) potting soil and the effect of high pH is quit evident on growth.